It’s rather hard to have life-threatening allergy eating out, but I don’t say that it’s impossible! My suggestion is to go to the higher-end spectrum of eating establishments, if you are the type to be cautious of any contact with your food. With lower-end establishments, they mostly use the same cooking utensils for their cooking, so the risk of cross-contamination will be higher, I think. Sometimes eggs hide in the most unexpected place, so better to ask. Careful of nasi goreng (fried rice) or any iteration of mie (noodles), most have egg mixed inside. Batter for most fried chickens I believe, contains egg. If you eat pempek (fish cakes with vinegar sauce), don’t eat the kapal selam (submarine) one because there’s egg inside. There’re also big bakso with egg or quail egg filling. Can also check vegetarian guide. Should be quite okay, but be careful of hidden fish sauce inside fried rice or fried noodles. Also hidden anchovies can be found inside water spinach stir-fry or kering tempe (sweet, dry cooked tempe stir fry). I think as long as you avoid noodles and bread/ flour based products it should be okay? Indonesian don’t really rely on wheat flour, so rice flour, sticky-rice flour, cassava flour, etc. based desserts can be nice alternative. Do ask, as the some dessert recipes sometimes mix both wheat flour and these gluten-free flour (like for bika ambon, for instance), and usually they’re being mixed in one container together. Cookies recipes also sometimes uses two kinds of flour together. Ice-based dessert should most be fine. Ronde (hot ginger drink with nut-filled rice-flour balls) itself is OK, but usually there are cubed sliced bread, you can ask the seller to skip this (they’re in separate containers). Avoid fritters and breaded/ battered stuff, including “asam manis” . Soy sauce (kecap manis), however, is rather hard but possible to avoid. If you’re very sensitive, don’t eat mie goreng, nasi goreng, sate (there are some recipes without). There’re not a lot of food I remember needing thickener, but if they do, usually they’re wheat flour, like cap cay. If you eat bakso, avoid the noodles, kwetiau and wonton, opt for the rice noodles. The same with siomay for wonton/ shaomay. Most bakso joints mix their meatball with flour, so please ask them first. This also applies to sausage/ galantine/ processed meat. Our egg omelet recipes usually don’t incorporate any flour, but can’t hurt to ask. Other egg-based dishes should be fine. All the peanut-sauce laden vegetable dishes should be fine, but sometimes soy sauce is poured on top of the peanut sauce, request to skip the soy sauce. Soto (traditional Indonesian soup, usually spiced with galangal) is preferable, with rice or glass noodles to sop (closer to “European” soup), which sometimes incorporates sausage, egg/ chicken roulade, meatball, or macaroni. A lot of kerupuk/ keripik should be gluten-free, but do ask in case they have some wheat flour mixed in. You should be wary of sale pisang (fried full banana slices). Choose bihun (rice noodles) (but not bihun goreng) or orak-arik (stir fried rice noodles with egg and vegetables), soto (but not soto with mie, though rare) tempe and tahu (non-fried variants), rice, ice desserts, keripik/ emping, … bumbu balado (… with chili), rendang. As this is one of allergy that’s rather prevalent in Indonesia, you can rest assured that it’s rather easy to avoid milk and cheese-based products. I… don’t have any food to be avoided ready, really. Maybe drinks such as sop buah (fruit soups) or es campur (mixed ice drink). Even traditional desserts don’t really have milk (but plenty of coconut milk). Should be okay with cooking oil, mostly are palm oil. Avoid pecel, gado-gado, siomay, ketoprak, karedok, lotek, batagor, rujak, pecel. A lot of our food is served with peanut sauce. Just skip the sauce and eat the vegetables if you still want them. Or eat urap (rawn vegetables with shredded coconut, without peanut sauce) instead. Except for deliberately going to seafood establishment, it’s quite easy to avoid. Maybe ask for ebi (small shrimps) or terasi (trassi, shrimp paste) under the sambal or peanut sauce. Except for deliberately going to seafood establishment, it’s quite easy to avoid. Be careful of hidden oyster sauce, cause that happened to me when I was small. Avoid any tempe (tempeh, soy bean cake) or tahu (tofu) products. Also careful of any kecap (sweet soy sauce) in the ingredients. I think this should be safe enough? No dish I know includes walnut, almond, hazelnut, cashew, pistachio, and Brazil nuts. A lot of other different nuts family though. I think, as a believer, religious dietary restriction is, at least, safer than allergy. Though I don’t drink, for example, even if I accidentally drink some beer, I don’t have any risk of dying, I think I have it easier. But, a belief is a belief, please be your best in following yours, religious or ethic. Usually mie … (… noodles), soto … (… soup), nasi …. (… rice) lontong …. (… with rice cake), pepes … (grilled banana-leaf … wrap), have some kind of meat accompanying them, though the base is alright. Ask if there’s any alternative without meat, because usually the ingredients are prepared separately before being cooked. Arem-arem (rice cake which has mostly tempeh or potato stir-fry filling) should be okay, but lemper (glutinous rice cake, which filling is mostly chicken) is not. Some spring roll have a kind of meat hidden inside all the bamboo shoots filling. Some fried rice and noodles have fish sauce or terasi involved. Even the simplest of vegetable dishes and soups can have broth or stock involved, mostly chicken or beef (unlike South Korea, which I am grateful of, who uses anchovy and kelp-based broth), so better avoid all the soup-y stuff, or just ask. Also see milk and egg entries. sayur … ( … vegetable dish) such as lontong sayur (wrapped rice with vegetable stew), sayur lodeh (vegetable soup), sayur asem (sour vegetable soup). Careful of the involvement of broth and terasi. jamur (mushroom) such as pepes jamur (banana-leaf wrap grilled mushroom) .Mushroom-based restaurant is getting more and more popular. tahu (tofu) such as kupat tahu (tofu, rice cake, vegetables, and peanut sauce) or tahu isi (fried tofu with vegetable filling), also tahu telur (basically tofu fritatta with sauce). Avoid batagor (abbrv. of bakso tahu goreng: fried tofu with meatball filling) or tahu petis (tofu with black shrimp sauce) . See milk, egg, and vegetarian entry. It is rather hard to avoid garlic and shallot for savory dishes. They’re almost everywhere especially in stir fries. Opt for non-stir-fried vegetable dish. Some peanut sauce have garlic as base. I believe you can ask the establishment to avoid them while they cook. Halal-eating is mostly easy in Indonesia. Although they don’t exactly have the halal label, it’s ensured that the meat products are halal (though this kind of belief is rather dangerous for any kind deception, really). Packaged food is mostly halal. It’s easier to eat halal in Java, parts of Sumatra, other parts of Indonesia that’re predominantly Muslims. Though not that many, some non-halal establishments exist, so if you find any babi (pork) in the menu, for example, you can ask the restaurant whether their other food is halal or not. B1 and B2 are usually “secret codes” for restaurant offering dog meat and pork. I don’t think there’s a Kosher butcher in Indonesia(? ), so no meat, I guess. Avoiding eggs maybe will be hard (ask for no telur (egg)). Susu (milk) is rather easy to avoid as well. Mixing food’s almost always likely. It’s rather easy to avoid gellatine in Indonesia, but most will be kosher. It’s also rather easy to avoid other seafood that’s not fish as well. I can only suggest go pescetarian or vegetarian in Indonesia, or butcher your own meat. Chicken is more widely eaten compared to beef, so this should be easier. 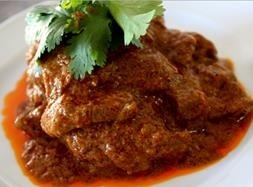 Rendang, for example, is made from beef, but you can find chicken ones rather easily. As well as soto. Nasi goreng (Indonesian fried-rice) and mie goreng (Indonesian fried-noodles) can easily be customised, especially if you’re ordering from food carts, so making it vegetarian or vegan shouldn’t be a lot of problem. Sometimes food cart doesn’t really wash their wok, so you should request for wok-washing first (or just avoid that seller) if necessary. Kecap manis (sweet soy sauce) is an essential part of the recipe, garlic and onion are pretty basic seasonings used, you can request to skip them, but they’re not really the most “authentic” way to cook them (not gluten-free, not soy-free, not Alleum free). Sometimes the recipe also uses oyster or hoisin sauce, but not fish sauce. If you’re avoiding noodles (egg, wheat), choose fried rice (usually the same seller has both) or less common rice noodles (bihun) option. Gado-gado is touted as THE vegetarian dish from Indonesia (though there are other friends: lotek, urap, karedok, pecel, and so on), but careful if the peanut sauce includes terasi (shrimp paste) or garlic, a lot of sellers use them in their recipe. Soy sauce is usually poured on top of the sauce, so ask the seller to hold this if you’re avoidig soy sauce. It’s rather hard to find vegetarian sate (satay), but kecap-ised quail egg satay (bacem) is common side-dish to accompany soto or gudeg. There are a lot of sate variants, but the one pictured below usually has soy sauce as marinade (even after you ask to not pour the soy sauce in the end). If you want to eat vegan sate, you should go to vegetarian or mushroom restaurant as they’re as rare as they can be, the same with bakso (meatball soup) and rendang (curried beef stew) (though tofu rendang or tempe rendang are actually common household recipes). Bakso is sometimes mixed with wheat flour (to reduce the amount of meat and other flour), so go to higher end establishment or ask the seller. 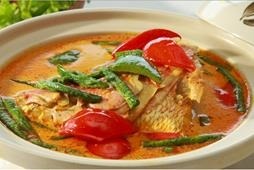 Rendang, however, is safe for gluten-free diet, without any wheat flour. Warning about the peanut sauce is similar with the one for gado-gado. Kecap‘s commonly used to marinate the meat. People allergic to soy can go to peanut sauce-free recipe such as sate lilit (sate wrapped on lemongrass). For soups, soto has 1001 variants in almost every region, sop is less, but soto is more likely to incorporate coconut milk, rice or glass noodles, shredded chicken/ cubed beef, etc. and sop is more likely to incorporate meatball/sausage/roulade, macaroni. As always, ask for the broth. 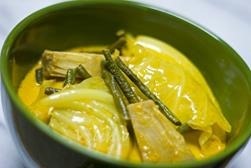 Or you can go for sayur asam or sayur lodeh (separated section below). Should be okay for most, except for peanut sometimes. Eh, there’s some using ebi, squid, and a lot of others too, so ask. Most broth are chicken or meat, and it’s almost everywhere in savory, soup-y food, so please ask first. Savory bubur is usually not-vegetarian friendly. It sometimes have peanut/ soy too. Sweet bubur should be okay for all, except for coconut allergy. All should be gluten-free (but skip the soy sauce at the end of savory bubur). 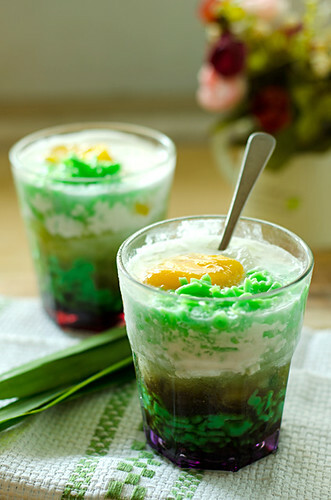 A lot of desserts are made using glutinous rice, rice flour, or cassava flour so they will be nice for gluten-free diet. Coconut appears quite a lot. The closer-to-cakes recipes sometimes have wheat flour mixed with other kinds of flour, so ask around. Aah, if you visit Indonesia, having Indonesian drinks is a must! I believe that most drinks are diet-friendly, but be careful of peanuts! They can be found inside drinks like ronde or sekoteng, you can request for no peanuts and no ronde (rice flour ball filled with peanut) (basically ended up with just ginger drink though). Those two also have bread cubes inside so request for drinks for people avoiding those cubes. Some ginger drinks such as STMJ (susu-telor-madu-jahe/ milk-egg-honey-ginger, which is obvious) or sara’ba are mixed with milk. Condensed milk is sometimes used for topping so request no milk in es campur (mixed ice) or skip sop buah that’s in essence fruits in milk or yoghurt (fruit soup(?)). Coconut is almost everywhere except in juice, tea, or coffee. To be safe, you can order teh manis (sweet tea) or jeruk (iced/ hot lime juice). I think fritters are mostly safe for vegetarian (except shrimp bakwan, but it’s usually more expensive). Big warning sign for gluten-free diet, egg allergy and soy allergy because of the flour and sometimes egg in the batter, and the frying process making cross-contamination with fried tempe and tahu is very high. Gudeg is a jackfruit curry. Based on its description, it should be fine for most diet (except coconut), but it’s usually cooked with either chicken or egg and with added krecek (cow skinstew). Request for without if you’re vegan or allergic. They’re mostly made from non-wheat flour, but it’s wise to be careful. Some, like shrimp crackers, fish crackers, or cow skin crackers (rambak), are definitely not vegetarian. Other than that, should be okay. Cautious of rempeyek, mostly made with peanut, especially termite rempeyek, which definitely not vegetarian. Sweet martabak (or terang bulan) is okay for ovo-lacto vegetarian, not okay for gluten free, avoid the peanut filling for peanut allergy. Savory martabak is only fine for omnivore or halal eating and allergen-free except for egg and wheat. You can still request to make it without the meat-filling though. The nasi kuning itself should be fine for most, but the side dishes will be tricky. Common side dishes are kering tempe (sweet, dry stir-fried tempe, sometime with anchovies and peanuts) or kering kentang (similar recipe, but with sliced potato), sambal goreng hati (chili and liver stir fry), shredded omelette (def. no flour), and shrimp crackers (usually no flour). Those tick a lot of no nos. Go for serundeng (relish of grated coconut and spices), urap (vegetable in shredded coconut), perkedel (potato (no flour) or corn fritters (with flour)), emping (melinjo/ Gnetum gnemon chips), cucumber and tomato. You can also go with similar tactic to a rijstaffel. I don’t know with other brands, but two of the flavour enhancers in Indomie is derived from fish (although there’s almost no other trace of animal products inside). If you’re a strict vegetarian, skip them. Opt to normal egg noodles (ovovegetarian) or rice noodles (vegan, gluten-free), also available in instant version (though with not-as-famous brands). Sad but true, a lot of Indonesian children prefer to have this as meal (no, don’t get duped by the eggs and vegetables in the cover). Please put protein and vegetable on top of your instant noodles! Mostly okay, Indonesian is mostly using palm oil, no one uses lard. If you’re avoiding palm oil for ethical reason, it’ll be hard though. There are a lot of sambal variants, so take special notice that most have garlic/ shallots as base, and a lot are with terasi (trassi, shrimp paste). Should be gluten-free and soy-free. 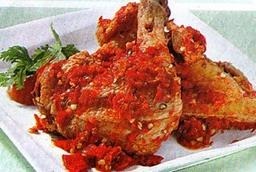 Except terasi and explained in the name (like sambal teri (anchovy), sambal hati (liver)), should be vegan. I believe this should be okay for most mentioned above, but some times it has peanut inside. On the other hand, sayur lodeh (vegetable stew) has coconut milk (and sometimes, tempe). Also be careful of the stocks used sometimes. It has a lot of choices, so there should be an option for every dietary restriction, I believe. Menu includes rendang (curried beef), curried fish, stewed cassava leaves, curried young jackfruit, chili eggplant, curried beef liver, tripe, intestines, or foot tendons, fried beef lung, fried chicken, and of course, sambal. Posted on February 21, 2016, in Culturing, Scattering, Travelling and tagged allergy, culture, diet, dietary restriction, food, halal, indonesia, peanut, vegan, vegetarian. Bookmark the permalink. Leave a comment.